Are you looking around your salon and seeing empty chairs? Not sterilizing enough combs? In this article, we’ll answer those questions by looking at what has helped our salon partners succeed. We’ll go over the basics of coupon design and provide examples of coupon discounts that have the highest rates of return. First, every coupon should have the name of your business, and like any advertisement, your coupon should provide contact information. It should clearly state your address, phone number, and possibly an email address. Last but certainly not least, the coupon should have a great offer. Most advertisements will use a dotted line to surround the actual offer. This not only serves as a suggested perforation if people don’t want to keep the entire ad, but they also highlight the offer. People automatically associate dotted lines with coupons and discounts. 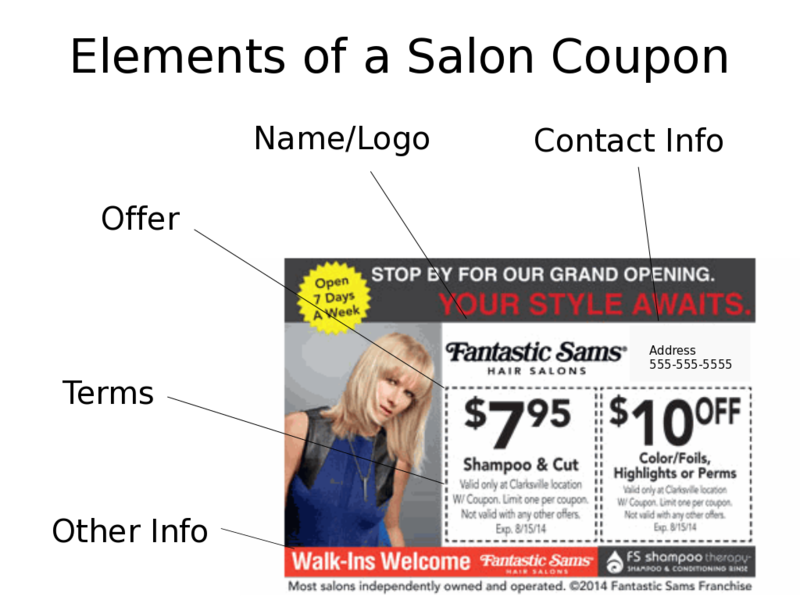 Your salon can place terms and conditions in small print beneath the coupon. Expiration dates and “cannot be combined with any other offer” stipulations protect businesses from being taken advantage of by overzealous couponers. Creating the offer is perhaps the most important part of the coupon design process. People are most interested in how much money the coupon will save. The offer is what gives the coupon its value. The text “$5 off” instantly transforms your coupon ad into a five-dollar bill. How do I create a hair salon offer that works? Quick service salons have the most success when they discount their primary offer — the haircut. Most customers are coming for a quick and affordable haircut, so these clients respond best to bold discounts. Make it Simpler – The most effective coupons advertise haircuts for less than $10.00. When constructing an offer, salons should usually avoid percentage discounts. Promoting a $9.99 haircut is more effective than advertising 16% off the regular price of $11.99. Make it Better – Salons that offer more than just basic services can offer compelling discounts on upgrades, such as shampoos. These coupons will be appreciated by current customers and can strengthen customer bonds. Make it Friendlier – Families often take their kids to quick service salons. A discount on Children’s haircuts is a great way to drive traffic from families, which means several new young customers! Register Tape Network partners with thousands of retailers in 33 states and has helped several salons diversify their marketing to build a stronger presence in their communities. Here are just a few notes from our many satisfied customers.